Welp, the launch month and a half away, I guess it's as good time as any to do this again! The new menu looks like so; a less-is-more kind of clean design with simple shader-based background. It comes with the familiar available selections and the list of the most recently completed Challenges (formerly known as Achievements). 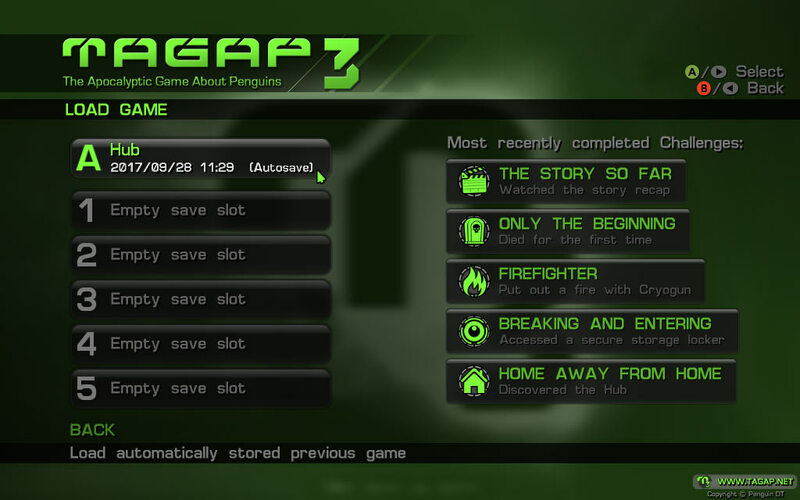 Just what it says in the title; loads the latest single player save – be it a manual save or an autosave. 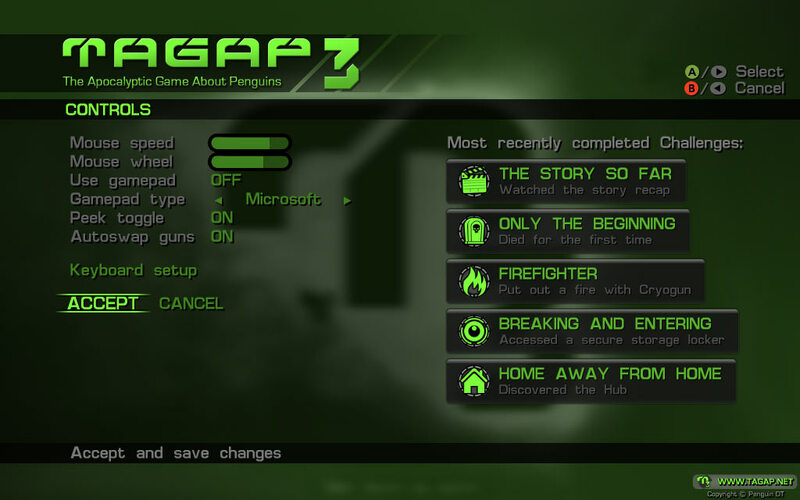 Here you can start a new game. Since TAGAP 3 is a 'pseudo-metroidvania' where you travel between the levels more organically, there is no need for a fancy level select screen this time around. 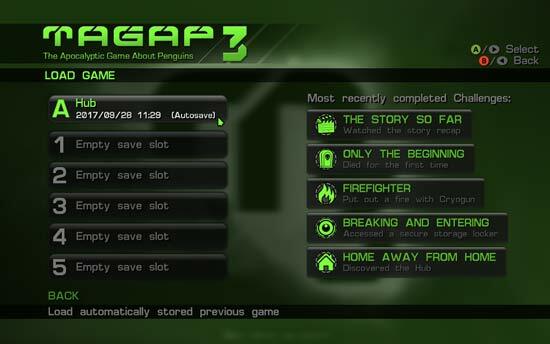 Simple but effective, the loading / saving screen instantly shows what the save slots contain. From customizing keyboard controls and adjusting mouse sensitivities, to gamepad usage, it's all here. You can even choose the type of the controller button prompts between Xbox, PlayStation and Steam Controller layouts. Pretty much what you would expect; Sound volume, music volume and voiceover toggle. 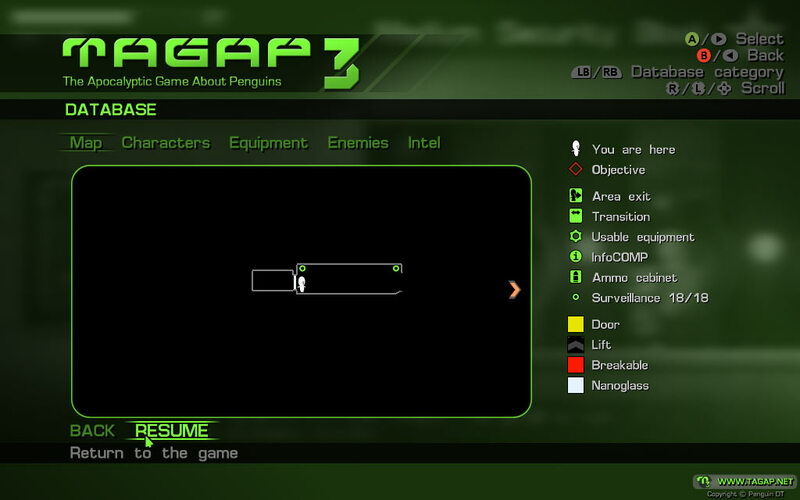 Additionally, you can choose the type of the in-game HUD; contextual HUD hides less-frequently updates elements (life counter, frag bar, etc.) until they are updated, whilst full HUD shows everything at all times. For effects, you can toggle post-processing effects, adjust the maximum framerate (between 30 and 120) and toggle vertical sync. 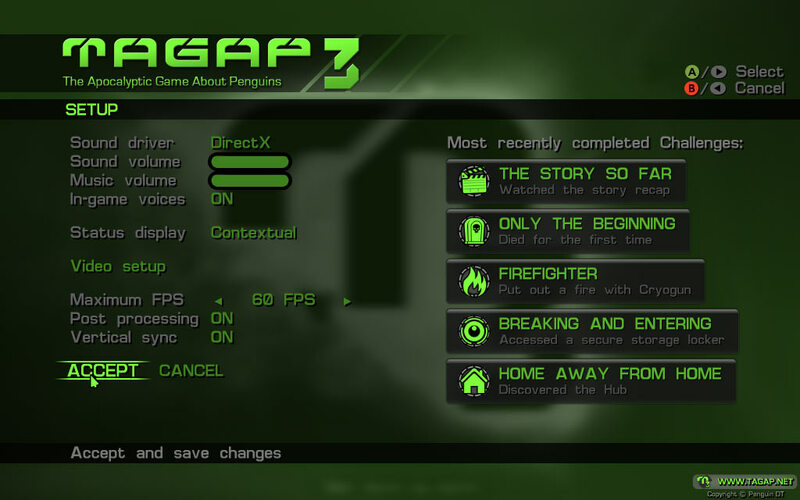 There are several video options you typically see that are absent, but remember; since TAGAP 3 is a rasterized 2D game – i.e. non-polygonal and based on rasterised sprites – things like anti-aliasing wouldn't affect a thing. And neither would a FOV slider. 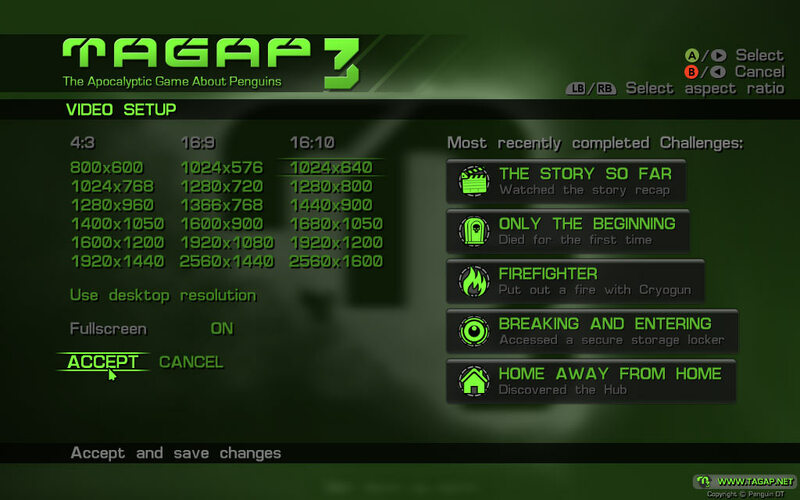 You can choose your resolution from the list provided, or simply hit 'Use desktop resolution' to match the game with whatever resolution you are using with Windows. I think it's worth noting that unlike the previous TAGAP games, TAGAP 3 is NOT upscaled, but the resolution you choose is the one the games is rendered in (the first two games were rendered in 800x600 and upscaled to whatever you chose). The in-game manual and lore hub that is way more detailed than it has any need to be. 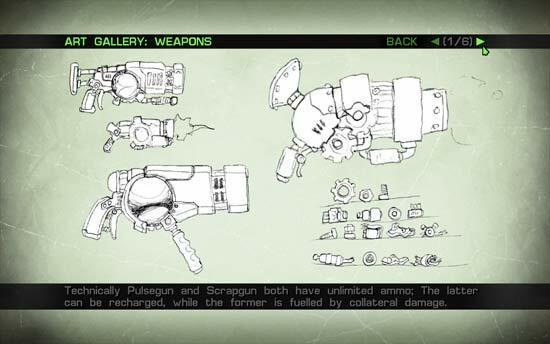 From weapon and enemy specs to full rundown of Pluto's society, it's all here. In fact, as a first for us, I spent so much time on this that I hired a professional translator Teemu Pesonen to proof-read it all. Wouldn't want the point of the text vanish because of my finglish typos, right? Since some of the maps are huge and sprawling, TAGAP 3 has an automap feature. 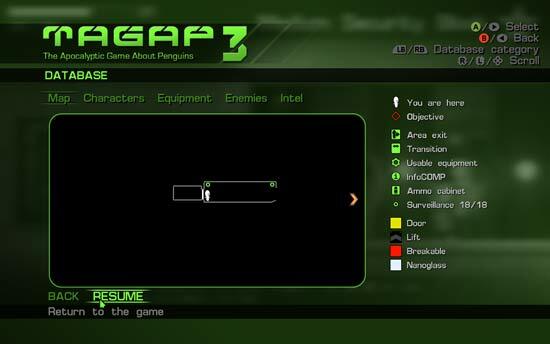 It updates as you progress through the level and always shows at least a general direction of your current objective. Also, accessing an InfoCOMP station will automatically give you the general map of the area (it doesn't show objects or hazards until you discover them yourself, but it does give you the shape of the map). By hitting the Database button (F1/Select/Back) you will go to the map screen by default, except when you've just unlocked a new entry and the icon is still shown on screen. In that case, the currently unlocked entry is opened instead. Your typical help text files. 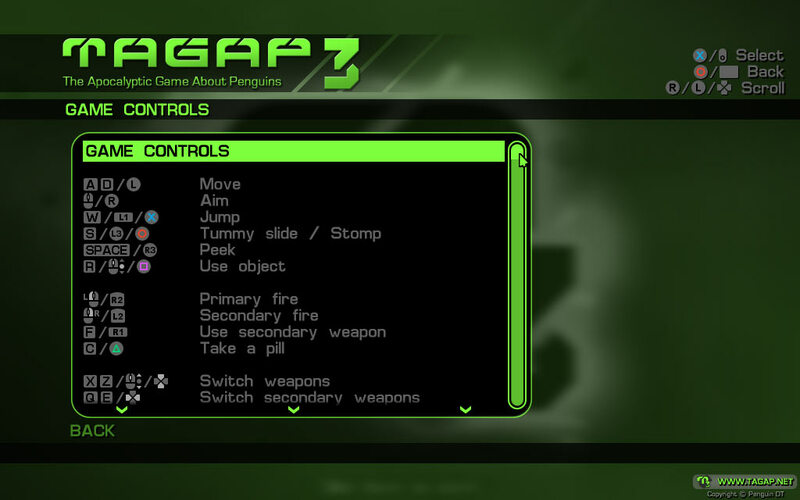 The Game Controls help menu is here shown twice, to showcase the previously mentioned adjustable controller button prompts. 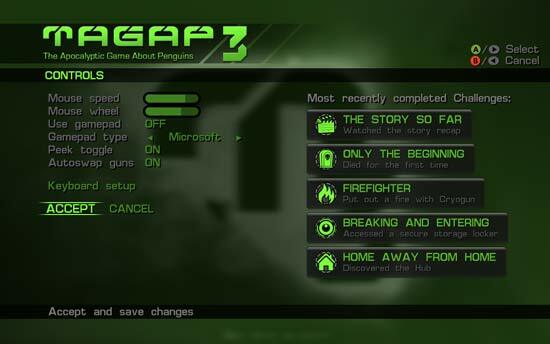 These prompts are always based on your current settings (key binds and chosen controller), so whenever you get a prompt – whether in a help text, in the database entry or in-game tutorial – it always shows the correct controls. 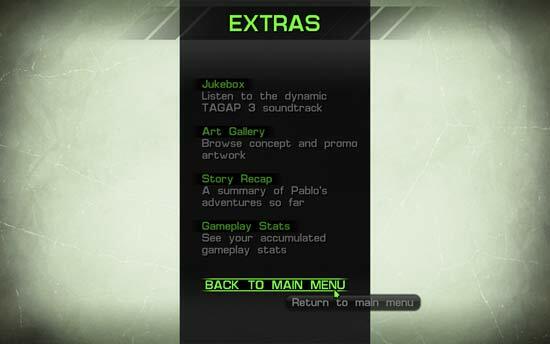 Here you can browse the game's extra content. As usual, we have an art gallery, the Jukebox (featuring the game's dynamic in-game soundtrack) and the game stats tracking. Some of these are locked at the start, but become unlocked the further you get in the game. 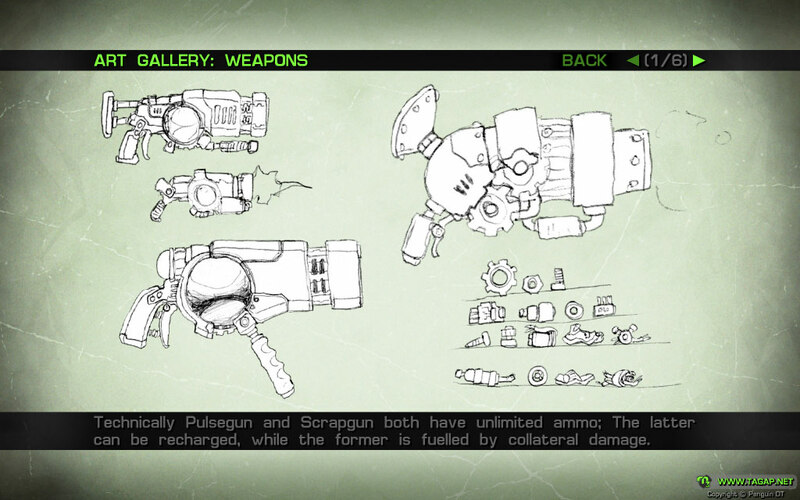 An example page from the 'Weapons' art gallery. There are currently 70 pages of concept and promotional art for you to browse, with perhaps a few more still on the way. 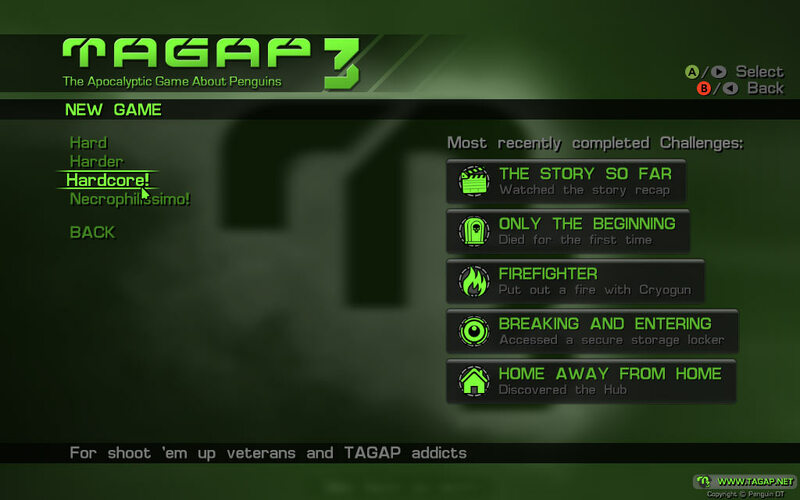 Right now I'm all about the final audio implementations – setting up the narrated 'previously on TAGAP' intro, inserting the penguin vocalisations everywhere they are needed and of course placing and scripting the music. First things first, working with Neil Gardner of Ladbroke Audio was great! How the collaboration came about started with me asking Big Finish Productions about where to even start with this and they pointed us towards Neil and Ladbroke. Originally Neil and I discussed about hiring a voice actor, but when Neil recorded his demos – which he originally meant to work as guides for the to-be-hired actor – they were so great that Neil Gardner himself became our Narrator. Huge 'thank you' to Neil and Ladbroke once more, the intro is now so perfect I have to pinch myself! 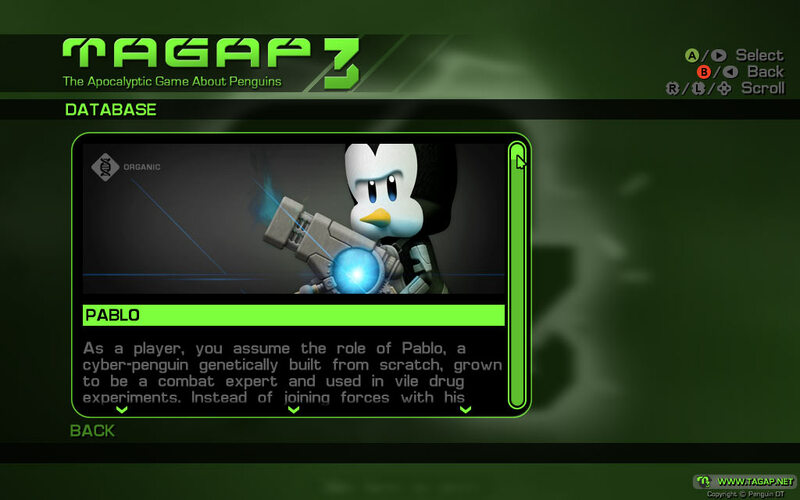 As for the less professional part of the voice overs, the penguin sounds have almost all been recorded – and about 75% have already been inserted into the game. We did do a video recording of the sessions, so if everything goes as planned with TAGAP itself, next month I can take a small break from the end crunch to edit a 'behind the scenes' video from it all. And finally, the music. Almost all of the in-game soundtrack is now implemented, only a couple more to go. The implementation is pretty fast, but still more involved than just dropping the OGGs into our data folder. See, I have to create the millisecond-based loop points for every single track, ensuring the songs loop around organically – and these loop points have to work with both the 'action' and 'chill' versions of each dynamic song. But yeah, we're on the final stretch for sure – which is a darn good thing, considering we have about a month and a half left on the clock! Playlist is a regular feature in our Penguin DT blog; A chance to highlight cool games both old and new that I've been playing. As always, I believe that in order to make games, you need to play them, preferably with a broad scope when it comes to genres, so each day I dedicate at least an hour to actually playing games. The rest of the free time? There is no such thing, it all belongs to TAGAP! Since the previous update, I've been so chin-deep in TAGAP 3 that I've had much less time to play games, so I've been playing just one; Agents of Mayhem by Volition. In case you've missed it, Agents of Mayhem is a single-player-only open-world hero-shooter set in the 'alternate Saints Row universe' that was birthed in the aftermath of Gat Out Of Hell. Does that sound too bonkers to grasp? Well, by single-player-only, I mean it's a single player game, focused squarely on ripping apart a futuristic cartoon Seoul solo. And by hero-shooter, you play as three Agents at one time – swapping between the characters at a press of a button – combining their diverse skill sets into a maelstrom of, well, mayhem. And the 'alternate Saints Row universe' part means that this is essentially a brand new world, but some familiar Saints characters make an appearance, in a world where The Saints games never happened. Instead, the world is being attacked by LEGION, a league of super-villains much like out of Saturday morning cartoons. One of the LEGION, Persephone Brimstone, didn't like where things were going. Instead she formed MAYHEM, agency of super-misfits, to fight against LEGION. I really dig the game, it's quite like a proper Crackdown sequel we never got. 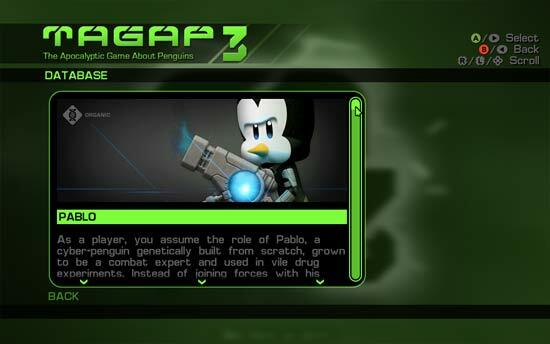 It has the same super-hero-sandbox feel, only with anarchy and fowl humour Volition is known for. Wrap everything up with a fantastic cartoon presentation and villains you'll love to hate, I can't help but to enjoy it. Mix it with great controls and megatons of explosions, it has been a brilliant game for resetting my brain during this TAGAP 3 crunch. Only thing I'm not fond of in the game is the way the LEGION lairs – which you raid in both the main and the side missions – are constructed. They are essentially a tile-set of rooms interconnected by corridors, and in case of side missions, seemingly randomised. Though the varied objectives do give an illusion of actual variety, you'll soon start to recognise the repeating rooms. And since you see these lairs a lot, this starts to feel unnecessarily grindy, no matter how much fun banter accompanies the missions. Luckily, there's plenty to enjoy in the game outside of the lairs. True to its Crackdown vibes, collecting glowy ability-enhancing power-ups from skyscraper rooftops via super-hero parkour is always fun, while the interactions between the colourful characters never gets old. Plus Johnny Gat is back – can't argue with that! But seriously though; does it make me evil that I now would absolutely love to get a full August Gaunt album? I mean, come on, this parody of an autotuned douche pop-star is just too perfect, right down to his catchy radio tunes. 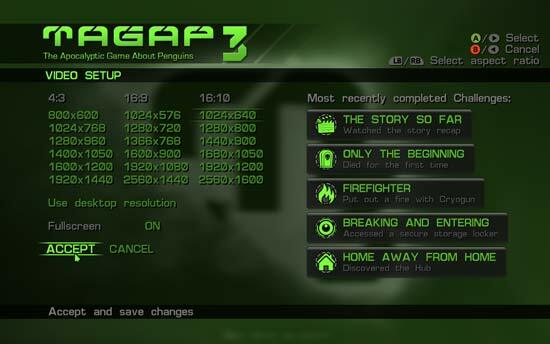 On TAGAP 3 front, finishing it! Seriously. How exciting is that?! On games front? Wolfenstein II is around the corner and I'm super-psyched about that, but in the meantime, this would be a good time to finish that Resident Evil marathon. Perhaps I can get to Resident Evil VII before the year ends.